Afghans for Angels is an organization made up of volunteers who make and distribute baby blankets to California hospitals (and others under special circumstances), to give to parents who have suffered the loss of their infant through miscarriage, still birth or infant death. We also provide afghans to individuals requesting them and to hospitals outside of California who do not have access to them otherwise. 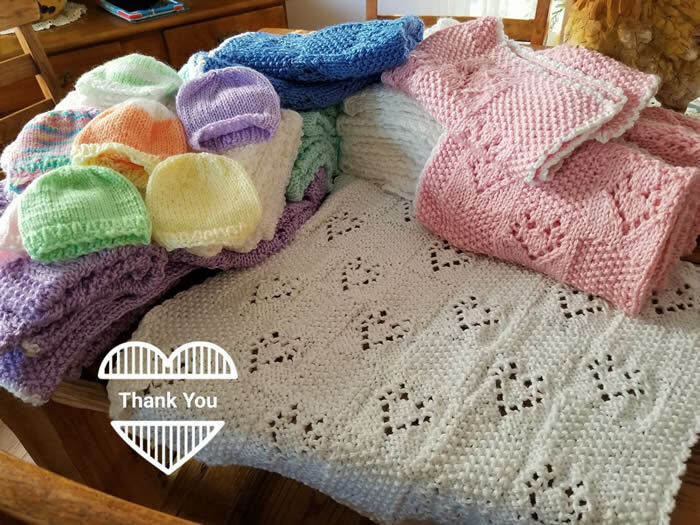 Please see a recent news segment on Channel 2, CBS LA: "Volunteers Knit Afghans For Moms Of Stillborn Babies So They Will Have Something To Cherish"
The death of a child, whether by miscarriage or later on, is a devastating event in a parent's life. While this is sometimes a very difficult subject to speak of, it does happen nonetheless. Our "Afghans for Angels" are placed lovingly around these infant angels when they are held by their families for the brief time in which bittersweet hellos and sad good-byes are said. The parents are then allowed to keep these afghans as a token of remembrance of their baby. We want to acknowledge that these parents did have a baby. Though their child did not live long, we do not want to diminish the fact that they were and will continue to be the parents of this child. The California Chapter of Afghans for Angels became active in April of 2010. We are looking for volunteers to help create these afghan gifts. If you can knit, crochet, or quilt, we would love to have your help. Donations of soft yarn in baby colors would also be appreciated . Each afghan donated will be tagged with two cards held on with ribbon. One card is for the family, and one is geared toward the hospital staff. Please make the afghans in baby colors, with soft yarns and patterns working best. "Angel afghans" need to be no larger than 36 inches square. Most needed are afghans that are only 15" to 24" square. Any extra-special touches are welcome. Most of all, we need your help to get the word out. The more volunteers we have, the more hospitals (and families) can benefit from our services. Should you need a little help to get started, www.lionbrandyarn.com has a wonderful section for free crochet and knit patterns specifically for babies. Another web site, www.crochetkim.com, also has some nice patterns that are free. I have located some free preemie patterns as well at www.crochetpatterncentral.com. I would like to thank you for helping us to make just a tiny difference at a very sad time for these families. Just the knowledge that someone cared enough to create a special gift for their child is certain to provide a measure of comfort. Angel afghans and/or donations of yarn may be mailed to the address below. We have now had over 3,500 afghans donated by many volunteers. While this may seem like a lot, we can NEVER have too many. We have over 25 hospitals/organizations receiving afghans from us. We have expanded to Rainbow Babies and Children's Hospital in Cleveland, Ohio, Ashley Medical Center in Vernal, Utah, Brigham City Community Hospital in Brigham, Utah, and Driscoll Children's Hospital in Corpus Christi, Texas. We also donate to photographers who volunteer their time to the Now I Lay Me Down To Sleep organization. We continually seek out new hospitals wishing to receive our afghans, and we are open to having any hospital request our afghans. Remember, we can never have too many volunteers or too many afghans, so please don't hesitate to join us. Should you have questions, please feel free to contact me at any time.